The Ilya Peckerman Research Fund was created in 2010, in honor of Ilya Peckerman. The focus of our fundraising is awareness and education. Early detection and diagnosis of vasculitis is a key for prolonging and, ideally saving, a patient’s life. With education and early diagnosis in mind, the Peckerman family, in conjunction with the Vasculitis Foundation, is working with a prestigious NYC-based hospital to create the Ilya Peckerman Vasculitis Teaching Fellowship Program. 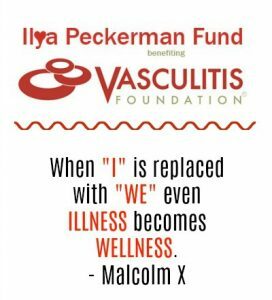 In addition to funding extended education for fellows, fellows in the Ilya Peckerman Vasculitis Teaching Fellowship Program will go to New York and New Jersey hospitals/medical centers to educate primary care doctors and nurses about the early signs of vasculitis disease, in the hopes of getting patients a quicker diagnosis and directing them to proper care. A husband. A father. A grandfather. A friend. A jokester. A volleyball player. A BBQ master… and so much more. On December 18, 2009, Ilya Peckerman passed away from complications associated with Wegener’s granulomatosis, days after his turning 56-years-old. When somebody passes, we are left with two options: mourn and try to move on, or mourn, try to move on and move the needle forward. The Peckerman family has chosen to move the needle forward, by helping to raise money to improve the lives of those in the vasculitis community, with the help for the Vasculitis Foundation. Ilya Peckerman lived a life full of love, energy, and zest. We carry his youthful spirit in our hearts, and share his carpe diem attitude with everyone that is part of the vasculitis community. To date, family, friends, and supporters have raised over $111,706.00 for the Vasculitis Foundation’s programs!